Throughout his career, photographer David Stephenson has been drawn to sacred spaces, whether they are sites of religious worship or landscapes that cultivate a sense of the sublime. Stephenson’s affinity with the American New Topographic movement in the 1970s precipitated his fascination with the tradition of landscape photography. Pursuing new ways to represent the land outside the aesthetic strictures of the documentary approach, Stephenson’s work is, according to Australian writer Daniel Palmer, ‘imbued with romantic sensibility’ 1 and confronts philosophical concepts such as the infinite and the unknown with a minimalist sensibility and poetic acuity. 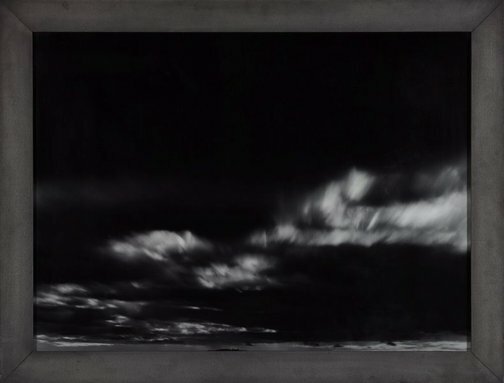 Stephenson’s 1990 cloudscapes serve as an oblique homage to American photographer Alfred Stieglitz’s 1922-1935 series of cloud photographs, ‘Equivalents’, that often excluded identifiable reference points like the horizon line. The clouds in Stephenson’s images become studies of luminous abstract forms. Pockets of light submerged in darkness, these nebulous clouds eschew legibility and evoke allusions to the transcendent and the sublime. Signed and dated c. verso frame, black ink "David Stephenson / ... 1990 ..." and l.c. verso image-mount, pencil "David Stephenson 1990".